Let us introduce the very latest in iPhone skins; The MiLi Power Skin! 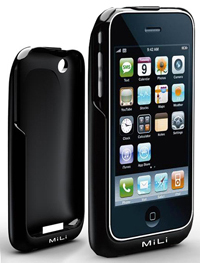 This is the world’s thinnest ever iPhone case with battery charger that nearly doubles the life of your battery. Say goodbye to chunky and clumpy additions to your iPhone that can make it almost impossible for it to fit in your back pocket. With the Power Skin’s sleek and form fitting design we are extremely confident you will love this product. It comes in a variation of colours, so we guarantee there will be something that fits your style. The Mili Power Skin gives you up to a whopping 19 hours audio play time, 5.4 hours of video playing time and up to 230 hours of stand by time, never again will a commute into work be boring! Not only does this battery pack give you unrivaled power reserves but it also protects your treasured iPhone from knocks and scratches with its hard shell case. This is clearly an essential purchase for your ever faithful friend; the iPhone. Buy this product now by clicking on the buy now button below and receive within 2-3 working days.